$ 10.95 EACH #2694 SS 1"
Extremely strong and durable. For 1" (2.54cm) Outside Diameter Tubing. #2696 SS Heavy-Duty Includes Set-Screw. 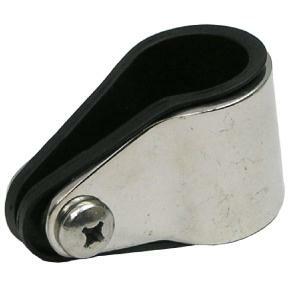 $ 12.95 EACH #2696 SS 1"
CHOICE: for 7/8" (2.2cm) -or- 1" (2.54cm) Outside Diameter application. 1/4" Diameter; Toggle Pin is approximately 1-1/4"Long w/spring (1-1/2" to end). For 1" (2.54cm) Outside Diameter Tubing. $19.95 EACH #2699 SS 1"
but comes out cleanly with a sideways pull. Steel Wire Lanyard. Approximately 1-1/4"L pin; 1"Dia. Ring. 316 Stainless Steel highly polished for a brilliant finish. Stainless Steel ~ 1" SNAP HOOK 304 Stainless Steel.